The rustic mining settlement of Opalton lies around 120km south west of Winton, and is home to the Queensland Boulder Opal. 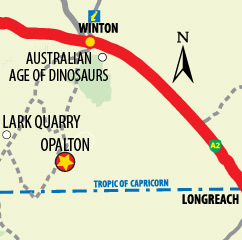 First discovered in 1888, the boulder opal is unique to Queensland’s Tropic of Capricorn, occurring within a belt of weathered Cretaceous sedimentary rocks known as the Winton Formation. The ground water here is rich with minerals and silica from remains of the old inland sea. Water seeped into gaps deep underground to ironstone boulders, and as it dried and gelled opal formed. The friction within these faults created static electricity. A combination of mineral rich water and a slight electrical charge has grown a crystal structure inside the opal that refracts light, creating the stunning appearance of this Tropic treasure. The largest piece of opal on record was uncovered at Opalton, a pipe opal over three metres long. With a fossicking licence you can try your luck ‘specking’ and ‘noodling’ for fragments of opal from the surface or spoils of old workings. Licences are available for one to 12 months and can be obtained from the Mining Registrar in Winton and the Opalton Outpost. There are camping facilities and basic cabins at the bush park. How can I experience Opal Country? Purchase a fossicking licence: Fossicking is a regulated activity in Queensland. A fossickers licence entitles entry and fossicking on any non-exempt land in Central Queensland. You can obtain a fossickers licence when you arrive, alternatively visit the Department of Mines and Energy website for a list of agents for fossickers licences in Queensland.